Pan-frying and deep-frying are two things that I don’t really like doing at home as it always involve using high heat – high heat causes oil to smoke and to spurt further, and because there is no partition between the kitchen and living room, the smoke and oil will “travel”, making the whole house smoky and oily! 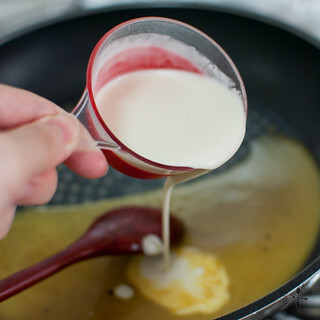 But that doesn’t stop me from trying frying recipes as frying does has its perks – it gives food the nice golden-brown hue, makes them crispy on the exterior, and food cooks relatively faster as compared to baking or braising! When I saw Nigella’s recipe on a simple dish of pan-fried pork chops, I knew I had to try it. I first prepared the potatoes and carrot and when they are happily boiling away in the pot (beans will be added in just 30 seconds before they are cooked), I pan-fried the oiled, salt and peppered chops. It’s a smoky and oily affair but I just love the sound of pork sizzling away in the pan! 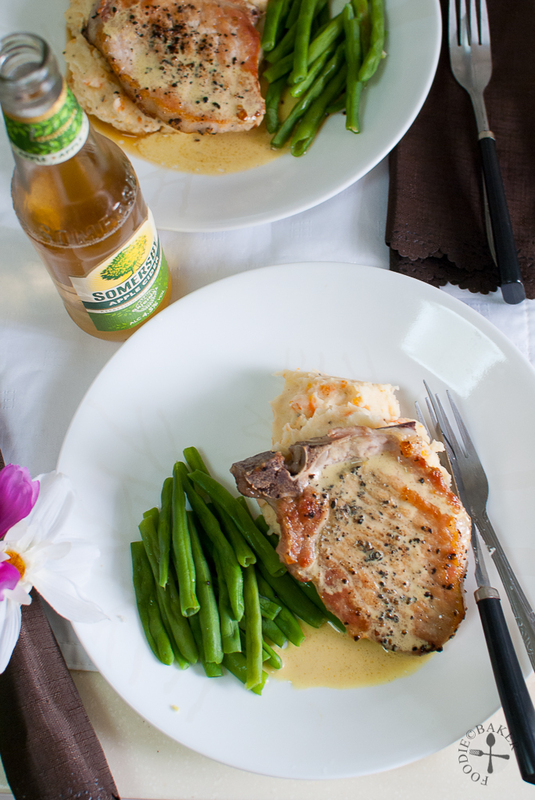 After the pork chops are cooked, I set them aside, covered, to rest before whisking in cider, mustard and cream to mingle with the pork juices to create an irresistible sauce that is delicious on both the pork chops and mashed potatoes! And the best part? All the above can be done within 30 minutes! And here’s how to make the pork chops and the sauce! 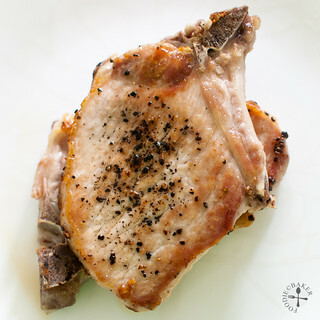 1) Pan-fry the pork chops. 2) Pour in cider and bring to a boil. 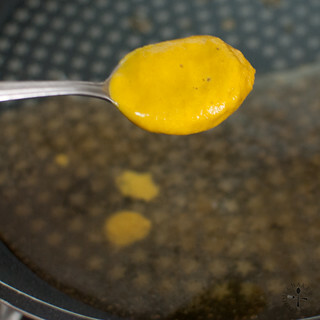 3) Whisk in some mustard. 4) And a little cream - that's all! 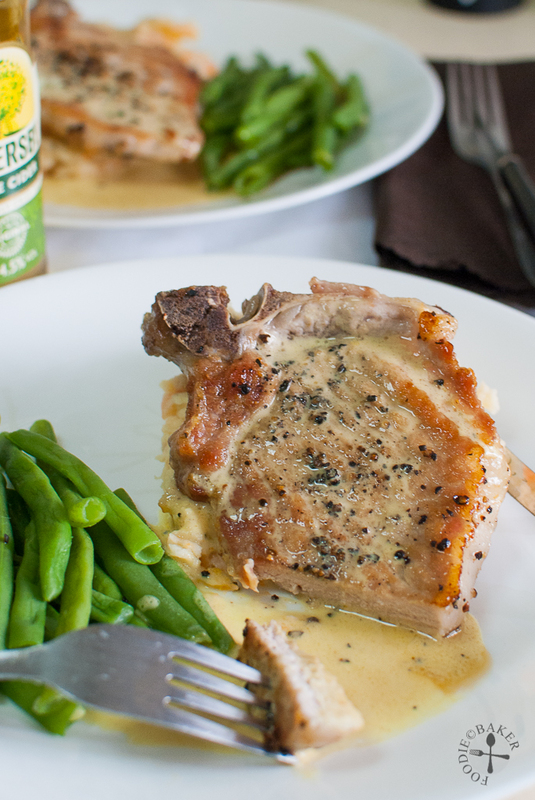 Spoon the sauce over the glistening pork chops and serve with sides! I’m submitting this to Cook Like A Star, hosted by Zoe from Bake for Happy Kids, Joyce from Kitchen Flavours and Anuja from Simple Baking. Do check out HERE for all the foodies’ attempt on Nigella’s recipes! Rinse the pork chops and pat dry with paper towel. If the pork chops are very thick, place them in a Ziploc bag or in between 2 sheets of clingfilm and bash it with a rolling pin until they are thinner. 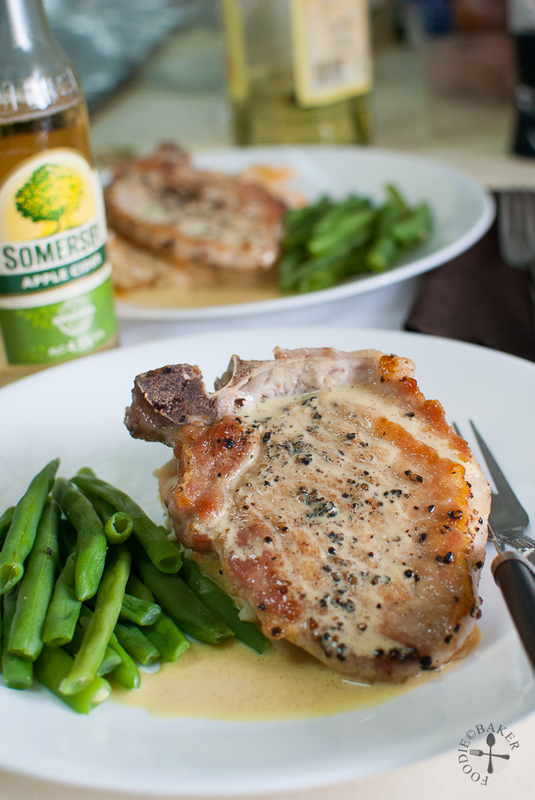 Drizzle olive oil on both sides of the pork chops and season well with salt and freshly ground black pepper. 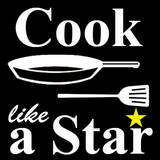 Heat a frying pan on high heat until very hot, turn the heat down to medium-high and add in the pork chops. Don't touch the pork chops until one side is well browned, about 3 to 5 minutes. Turn the pork chops over and cook for another 3 to 5 minutes until fully cooked through. Turn the heat down if necessary. Remove the pork chops onto a serving plate. Cover with aluminium foil and let rest for 3 minutes while you prepare the sauce. Add in the cider and whisk to get all the bits stuck onto the frying pan loose. 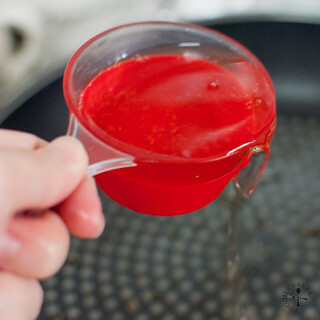 Bring to a boil on high heat then turn the heat down to the medium and boil for 1 minute. Stir in the mustard, followed by the cream. Season with salt and freshly ground black pepper. 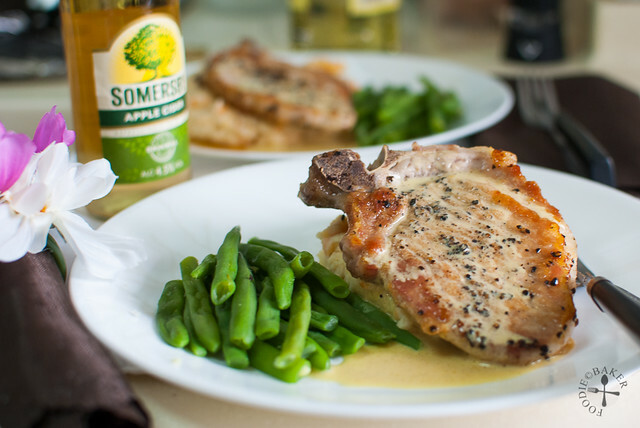 Spoon the sauce over the pork chops and serve immediately with sides - like mashed potatoes and boiled/sautéed greens. I can see your point about pan frying and deep frying… When the weather is good, I will pan fry and deep fry my food at my balcony :p My husband reckon that the ants will help us to clean up the mess – LOL! Hi Zoe, you are so lucky to have a balcony to do all the frying! All the oil and smoke won’t get into the house! I’m quite sad my new house won’t have a balcony, hoping to find some way so that I can fry to my heart’s content but still won’t get an oily house… haha! Hi Jasline, the pork chops look so yum! Hi Lian, thank you! Hope you’ll make them one day! Ooh, I’ve never seen this Nigella recipe. Sounds good! Delicious pork chops. Loved your beautiful photos. Hi Veronica, thank you for the compliment! This looks so delicious! If you are my neighbour, I’ll shamelessly invite myself over, with a bottle of wine! Perfecto! You did GREAT! Big Yumms and I love the quality of your pictures too! Hi Emily, thank you very much! I’m glad you like the photos! You’ve done Nigella proud. These look positively delicious and succulent!